This tasty butternut squash dish will please even the most avowed squash-haters in the family. Brown sugar, maple syrup, butter, and some cinnamon and nutmeg flavor the butternut squash, and it goes well with ham, pork, sausages, or just about any meat or poultry dish. Butternut squash is one of America's favorite winter squashes. It's relatively moist and has a sweet, nutty flavor. This baked dish is an easy way to enjoy the squash. Cubed butternut squash is also a nice addition to roasted Brussels sprouts. Lightly grease a large baking pan or spray with nonstick cooking spray. Peel the squash with a vegetable peeler, scoop out seeds, and cut the squash into 1/2- to 1-inch cubes. Put the cubed squash in a large bowl. Heat the maple syrup, brown sugar, butter, cinnamon, vanilla, salt, and nutmeg until hot and the butter has melted. 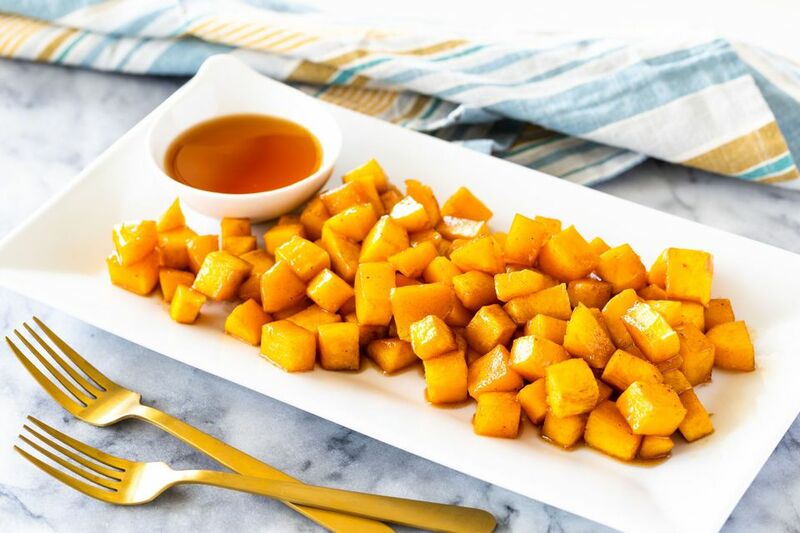 Drizzle the syrup over the squash cubes and stir gently to coat. Transfer the squash to the prepared baking dish. Cover the dish with foil, and bake for 30 minutes. Remove the foil, stir the squash gently, and bake uncovered for about 15 minutes longer, or until squash is tender. Serve this squash with a baked ham dinner or with pork, beef, or sausages. To peel the squash easily, slice off the ends and use a straight or y-shaped vegetable peeler. Add some diced apples or pears to the squash mixture, or add some toasted pecans when you uncover the pan.